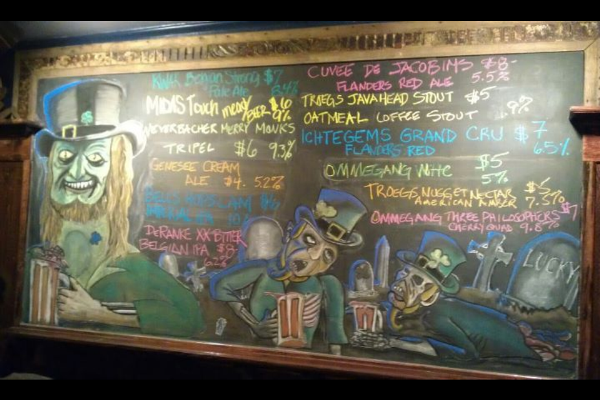 St. Patrick’s Day is quickly approaching, and here in the Lehigh Valley we have quite a few things that are going on all across the area to take advantage of. Allentown is ridiculously holding their St Patrick’s Day Parade on the day after St Patrick’s Day at 2:30pm. If you’re not going to be extraordinarily hungover and want to partake, check out the details here. Allentown Brew Works will have have Irish dancers from the O’Grady Quinlan Academy of Irish Dance at 7pm as well as green beer and $5 carbombs. Food specials include smoked salmon salad, corned beef and cabbage, reuben sandwiches, shepherd’s pie, bangor sandwiches, cream of potato leek soup, and colcannon. The Jameson & Beer Dinner will also be going on. The City of Bethlehem, in partnership with the Celtic Classic, will be hosting the Parade of Shamrocks at 1pm. It runs from 13th Ave and Broad St onto Main Street and ends on the Hill-to-Hill Bridge. There’s a big afterparty starting at 1:30pm with beer, food, and soft drinks available. The Glengarry Bhoys will be performing and the event organizers will host a Finnegan’s Wake. Everything wraps up at 8pm. Bethlehem Brew Works will have Irish dancers from the O’Grady Quinlan Academy of Irish Dance at 3pm. They’ll also have bagpipers playing music, green beer, $5 carbombs, and a Bourbon Barrel Aged Scotch Ale on tap. Food specials include smoked salmon salad, corned beef & cabbage, reuben sandwiches, shepher’s pie, bangor sandwiched, cream of potato leek soup, and colcannon. The Goose in Bethlehem is having a party for $10 a person. The proceeds go to benefit the Lehigh University Marching 97. They’ll have a St Patrick’s Day buffet, NCAA March Madness on a big screen, a cash bar, and the Pedestrians Brass Band will be playing. The fun starts at 5pm and goes til 10. The Musikfest Café at the Artsquest Center will be hosting Runa, a Philly-based Celtic mashup band. Tickets are $10 for cabaret seats and $15 for balcony seats. Doors open at 6 and the show begins at 7:30. St James Gate at the Sands Casino in Bethlehem is having a whole bunch of promotions throughout the day. Let’s start with the music: From 3pm-6pm Sean Hennessey will be playing, from 6pm-11pm Fisher & Maher will be playing, and then from 11pm-1am Sean Hennessey will do an encore performance. Food includes Irish cheddar ale soup, potato cod brandade over mixed greens with a citrus vinaigrette, and Guinness-braised pork osso bucco with fingerling potatoes and veggies. They’ll also have a bar menu featuring shepherd’s pie, fish & chips, Reubens, and sliders. Drinks? For those they’ll have Long Ireland Iced Teas, sampler flights with Magners, Guinness, Harp, and Smithwicks, as well as Magerns Pear Cider and Guinness Black Lager in bottles. The Guinness Girls will also be present from 7pm to 8pm and if you check in on Facebook or Foursquare from 7pm to 9pm you get yourself a free t-shirt from the Sands. The Wooden Match will be doing $4 mug refills and have live music from 8pm til 1am. Easton will be having a variety of events going on catered to children, as well as an adult potato sack race. A forum on traditional Irish tea will be held at the Historical Society from 2pm to 4pm featuring soda bread, scones, cookies, tea sandwiched, and fresh brewed hot tea. At 4:30 there will be a parade heading from Washington Street to North Harrison Street and ending on East Dover St. All events are free of charge. Sagra Bistro in Hellertown is having some special Irish dishes on the menu from 4pm to 10pm including shepherd’s pie, corned beef & cabbage, colcannon, and Reuben nachos. Clearly catering to a more mature audience in some of the recently announced shows, the Sands Event Center announced shows by Loretta Lynn, Bob Saget, Jay Leno, and Kenny G.
Sheryl Crow, a nine-time Grammy award winner, will be headlining Musikfest’s Sands Steel Stage on August 10th at 8:30pm. Indie Canadian singer-songwriter Lights Poxleitner will be playing Planet Trog in Whitehallon April 21st.